Please select an option Pink stones - silver 925 Clear stones - 18kt gold plated over silver 925 Clear stones - 18kt rose gold plated over silver 925 Clear stones - silver 925 Please select a selectringstyle. Select Match Made In Heaven and say I DO... Put it on someone you truly love as even the heaven has conspired to bring you two together... Match Made In Heaven rings come in an elegant keepsake box for safekeeping however it's true place is not in the box but on the ring finger of your left hand, which is directly connected to your heart..
Rose Gold Ring is Made of pure 925 Sterling Silver with 18 kt Rose Gold Overlay, in 1 ct wt CZ stones that are handset and sparkle from all angles. 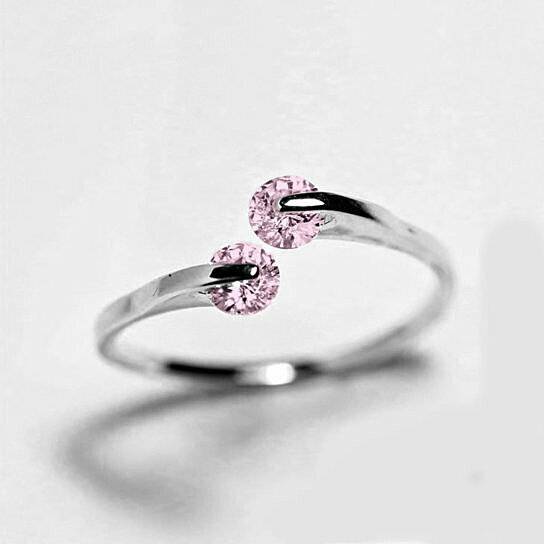 Pink Crystals Ring is Made in pure 925 Sterling Silver, in 1 ct wt CZ Pink stones ithat are hand-set and sparkle from all angels. The rings are adjustable in size and can fit finger sizes 6,7,8,9,10 and 11. You do not need to select the ring size at the time of ordering them. Select from: 1) Silver ring with Pink Diamonds, 2) Gold Ring with Crystal Clear Diamonds, 3) Rose Gold Ring with Crystal Clear Diamonds and 4) Silver Ring with Crystal Clear Diamonds.